Colour and finish will always play a big role in setting the style of your kitchen but nothing quite sets the tone like the type of door that you choose. On the Kitchen Trends Blog this month we’re giving you a variety of door styles, starting with the simplest through to the most embellished. They say less is more and a flat door is certainly the most understated kind of kitchen door. Often associated with very modern kitchens, they can also be used in contemporary kitchens by combing them with handles and different colour paint finishes/materials. The Modena kitchen is a matt, moulded handle-less door that achieves a very modern look with long sweeping clear lines and available in a range of colours. With minimal areas for attracting dirt, it is also very practical. The Mayfair door is as sleek as they come, with no concession to curves anywhere. This finish of pure right angles gives an almost seamless style. This silky gloss door is very modern but softened by the use of handles and by the option of curved units so that the kitchen flows around the space organically. It can be combined with a wood finish as shown here to make it more contemporary. While Salcombe is the epitome of simplicity, its painted doors and use of handles create a contemporary vintage look. Colours include cream, grey, blue, green and even a dramatic charcoal so it can achieve a number of looks. Doors with details such as Shaker style, moulded and inlaid doors add interest. Combine them with different types of handle to range from elegant detail, to elaborate style! Portland is a simple Shaker style that can give a contemporary vintage style in its ranged of soft colours or a very traditional feel when combined with plate racks and glass fronted wall units. 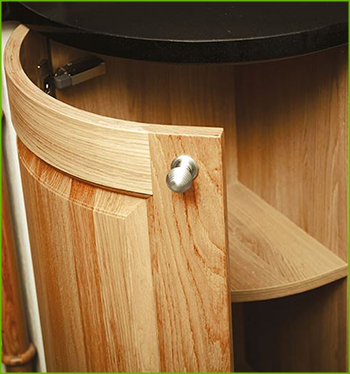 The Oakley kitchen ramps the detail up a notch with a beading detail on the inset. This one shown uses a crystal knob to add a touch of bling! Amberley has a 3D quality, with an almost optical illusion feel due to the angular nature of the centre of the door fronts. This creates a very traditional feel. We hope that this has given you a good overview of the kinds of looks you can achieve in your new kitchen, just based on door style alone. Why not take a look at them in the Daval showroom in Huddersfield? You can pop along at your own convenience or arrange to meet our kitchen designer there for a guided tour! We can also come to your home for a design consultation. Give us a call on 0800 321 3491 or complete our contact form. 0 Responses to "Kitchen Trends Blog – April 2017"